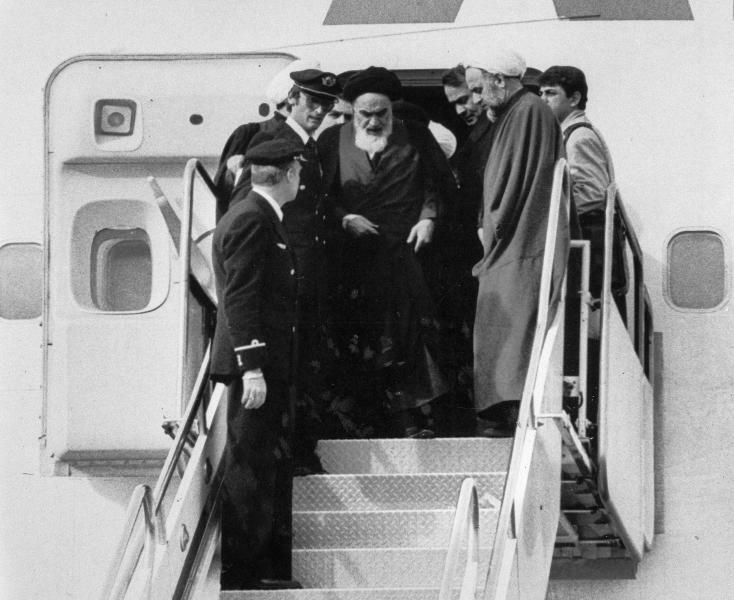 EDITOR'S NOTE: On Feb. 1, 1979, Iran's exiled Ayatollah Ruhollah Khomeini descended from a chartered Air France Boeing 747 to return to Tehran, a moment that changed the country's history for decades to come. Confrontations between security forces and demonstrators raged on even after Khomeini's arrival, which followed the departure of Shah Mohammad Reza Pahlavi. The U.S.-allied shah, fatally stricken with cancer, would never return and the caretaker government he left behind would soon fall to Khomeini's Islamic Revolution. That revolution would spark the U.S. Embassy takeover and hostage crisis, stoking the animosity that exists between Tehran and Washington to this day. Now, 40 years later, The Associated Press is making its story and historic photographs of Khomeini's arrival to Iran available. The story has been edited for typographical errors, but maintains the AP style of the day, such as using "Moslem" as opposed to Muslim. TEHRAN, Iran — Ayatollah Ruhollah Khomeini returned home Thursday after more than 4 years of exile to pursue his dream of replacing Iran's 2,500-year-old monarchy with an Islamic republic. As the chartered Air France jetliner landed with the bearded, 78-year-old religious leader of the revolution against Shah Mohammad Reza Pahlavi, a million excited followers lined the 1 mile route he was to take from the airport to Tehran's largest cemetery where he was to speak. Six tanks guarded the entrance to the airport, and the crowd made no attempt to get on to the field. But the army was keeping a low profile, leaving the policing of the airport to the normal security force there, while 50,000 "Islamic police" designated by the welcoming committee maintained order along the route to the cemetery. 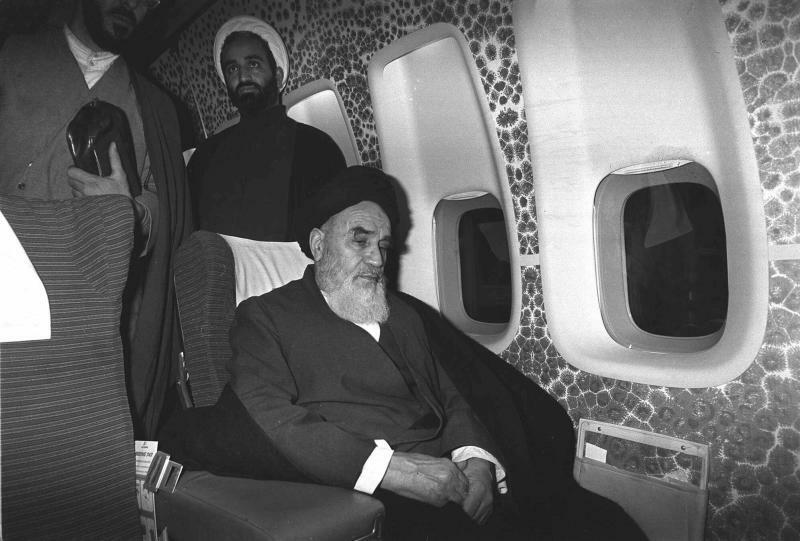 Khomeini's Boeing jumbo jet landed on schedule at 9 a.m. (12:30 a.m. EST) but 40 minutes passed before the Shiite Moslem patriarch made his appearance at the door of the plane. When he did, white capped military policemen rushed forward and shoed back photographers and a small group of well-wishers waiting at the bottom of the steps. The white bearded old man descended the ramp slowly, assisted by an aide and an Air France steward. He was escorted to a waiting Mercedes limousine which took him to the newly refurnished terminal building where a selected group of . faithful followers waited. The scene at the terminal was chaotic. Khomeini was held up for a time by a crush of 300 mullahs Moslem priests, reporters and others who blocked the entrance, shoving and pushing. One mullah tried to climb over the backs of reporters to see the ayatollah. Other mullahs appealed for calm over the terminal's loudspeakers, ordered the crowd to sit down and started chanting from the Koran, the Moslem holy book, to try to quiet the crowd. When Khomeini finally was able to enter the reception area, it echoed with cries of "Allah is Great" and "Khomeini is our imam," a Moslem title meaning "divinely inspired leader." Speaking in a loud, firm voice, the Ayatollah told his supporters: "We are succeeding, but this is only the first stage." "Our culture has been despotism and colonialism," he declared, attacking the shah's regime. "Everything we had has been thrown to the wind. . He the shah, has made the army follow the orders of another country," an apparent reference to the United States. Khomeini said the movement he inspired will be successful only "when the roots of colonialism are pulled out." He accused forces he did not identify of trying to restore the shah to absolute power but asserted: "The imperialist shah regime is all in the past and cannot be brought back again." "Our success," he said, "is the result of the unity of all the people in this country. They all follow one word Islam and even the religious minorities are united with Islam." Among those in the reception hall were representatives of the Armenian and Assyrian Christian churches as well as Karim Sanjaby, the leader of the political opposition to the shah, the National Front. Shouts of "Allah Akhbar" — God Is Great — rang out as the ayatollah finished his statement. 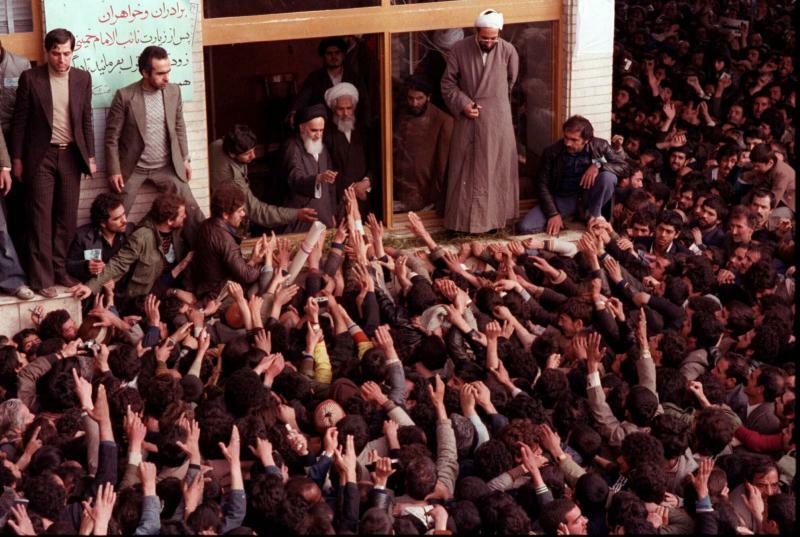 The crowd (surged) forward, and aides shielded Khomeini, who was backed up against a stair railing until Moslem marshals shoed the crowd back. At a news conference during the flight from Paris, aides of Khomeini said he probably would announce his own provisional government for Iran in the next few days. They said the nationwide strikes called by the ayatollah would be terminated after Prime Minister Shahpour Bakhtiar and his government agreed to resign and make way for an Islamic republic. In advance of Khomeini's arrival, leaders of the armed forces paraded tanks and troops through Tehran Wednesday to show that the decision to allow him to return did not signal surrender by the Bakhtiar government. Bakhtiar in a radio-television broadcast Wednesday night declared: "The government will not permit the reins of the country to be held by anyone except the central government." He said Iran was in a "very critical and dangerous period" and the government would "resist chaos and doubtful elements." Khomeini issued a brief statement before leaving Paris, thanking the French government and saying, "I leave your country to go and serve my country." A spokesman for Khomeini conceded that, after reports reached Paris of troops taking up new positions near Tehran's Mehrabad airport, some followers urged him to postpone his return. "But the ayatollah has made his decision and that is it," spokesman, Sadegh Ghotbzadeh, told reporters in Paris.